More than 4,000 tons of shells exploded near a military testing ground some 40 kilometers from the city of Orenburg in Central Russia, prompting the mass evacuation of two nearby towns. Those 4,000 tons included 1,379 tons of 100mm shells, 400 tons of air bombs and 2,300 tons of 280mm reactive shells, the head of the military investigative committee announced. Witnesses recorded video of a massive plume of smoke rising into the air shortly after the explosions. Local residents said that the blasts were powerful enough to rattle windows dozens of kilometers away from the epicenter. The press secretary for the regional government said that three residential buildings in the town of Pervomaisky were damaged in the incident, and that the force of the explosion blew out the windows of many local houses. Local emergency services confirmed that the blast wave from the explosions also blew out the windows of schools, kindergartens and a hospital. The explosions sparked a brushfire in 15-20 hectares of nearby dead grass. Authorities said that the fire does not threaten populated areas. ­Rescue workers immediately began evacuating the nearby towns of Experimentalny and Pervomaisky, dubbed ‘Donguz’ for the garrison of the same name located there. Initial reports suggested that 700 of the 10,000 people living in the two towns were evacuated. However, according to the latest estimates, 19 people were forced to leave their homes and move to four evacuation centers, where they were provided with hot food and water. Witnesses from the town of Donguz told RT they are being removed from the area, and claimed they saw a large number of military vehicles, ambulances, emergency workers, communication officers and repair workers heading to the site. Authorities are phoning local residents, explaining the situation and asking them to remain calm. Buses were dispatched to transport residents away from the area. The state of emergency for the area announced after the accident remains in effect. 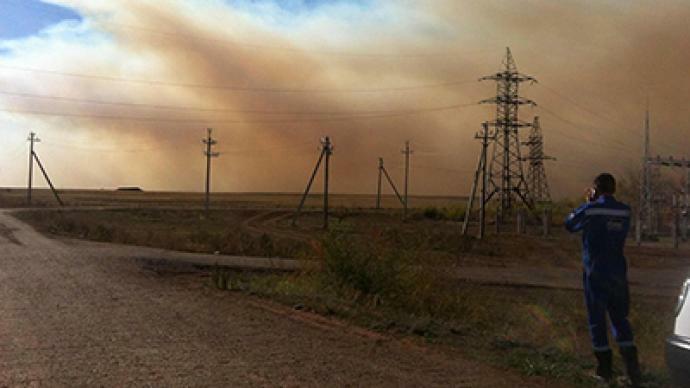 Twitter users reported that police have closed the roads leaving Orenburg. Local authorities confirmed these reports. Russian Railways announced that they restored railway communication in the area after a temporary disruption due to the incident. Initial reports suggested that a fire at the facility’s loading dock set off shells stored on a train for disposal. That statement was later disputed by the Press Service of Russia’s Defense Ministry, which claimed that no one was injured or went missing in the incident. The ministry also denied that a train loaded with shells was at the testing range, saying only three shells exploded. It was later revealed that over 4,000 tons of shells detonated. Local authorities later suspected a breach of safety regulations could have caused the explosions. A local hospital first reported that four people were injured in the blast, and said they expected the number of injuries to increase. However, the deputy chief doctor later denied that the hospital had accepted any patients in connection with the incident. Local resident Oksana Kovarnitskih told RT that many emergency vehicles were seen arriving at the scene of the blast and returning to a nearby hospital, presumably carrying people injured in the incident. Kovarnitskih had not heard any official confirmation of the injuries, though. Anxious comments about the aftermath of the explosions circulated on the Internet. Dunguz resident Valentina Aramova said the explosions were so powerful that some trees fell, the local Orenburg ‘56-media’ website reported. The local Health Ministry reported that no one was injured and hospitalized in the explosions. The main nearby hospital also told RT that they had not received any injured people. At the same time, local emergency services report that one officer has been hospitalized after he was found during the cleanup operation. Military investigators opened a criminal case into the incident, a spokesperson for the investigation department told RIA-Novosti news agency. Investigators deployed to the scene to determine the cause of the incident, which was classified as a “violation of rules of handling weapons and objects posing increased danger,” carrying a maximum penalty of two years in prison. Officials said that a full investigation may take more than a month. Other military-related accidental explosions have occurred in the region. On September 27, a missile disposal group commander was killed during disposal work at the Totsk testing range. On September 13, two military service members were injured in an accidental missile explosion at the Donguz testing range. Two more soldiers were injured during disposal efforts at Donguz on August 30.